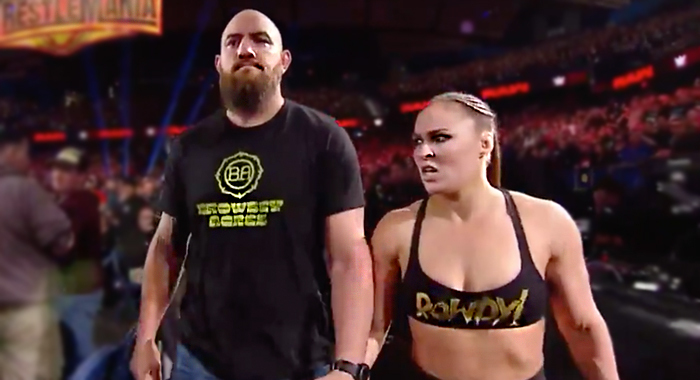 Last week RAW Women’s Champion Ronda Rousey was handed an undisclosed fine (in story only, of course) after assaulting a WWE official following a beatdown on Dana Brooke. The chaos continued this Monday night on RAW as well, but the “Rowdy” champion was not alone this time around. After defeating Dana Brooke in a quick title match, lasting no longer than 15 seconds in total, Rousey once again attacked an official, and this time took a few shots at a security guard as well. When the rest of ringside security attempted to physically restrain Rousey, her husband Travis Browne — another seasoned mixed martial artist and former UFC heavyweight — got himself involved in the action and actually delivered what appeared to be an incredible stiff elbow strike to the aforementioned security guard.